Even though Kenya has no idea what a Mummy is, he absolutely loved these hot dogs wrapped in whole wheat pizza dough. I put one in his school lunch the other day with sides of ketchup and mustard to dip it in and he was in heaven! 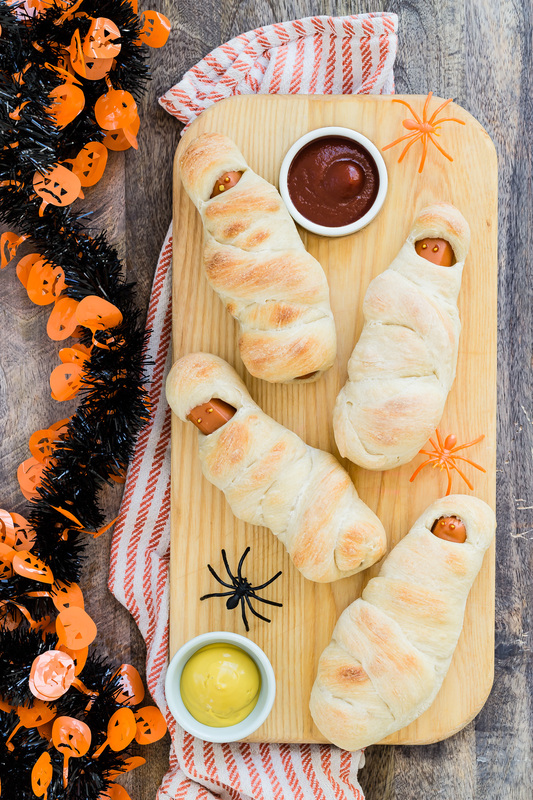 These are probably a better Halloween treat for bigger kids who really get what Mummies are, but they taste great and are fun to eat no matter what. So if you are looking for a fun meal to serve at a party this holiday weekend, or just a fun way to liven up your hot dogs, this is a perfect recipe! 2. Line a cookie sheet with foil and lightly grease with cooking spray. 3. Cut the pizza dough into 8 even strips using a pizza cutter or knife. 4. Stretch each piece of the pizza dough until it’s about 4 times the length of the hot dog. 5. Starting at the top, wrap the pizza dough around the hot dog until it’s completely covered allowing a small space for the face. 6. 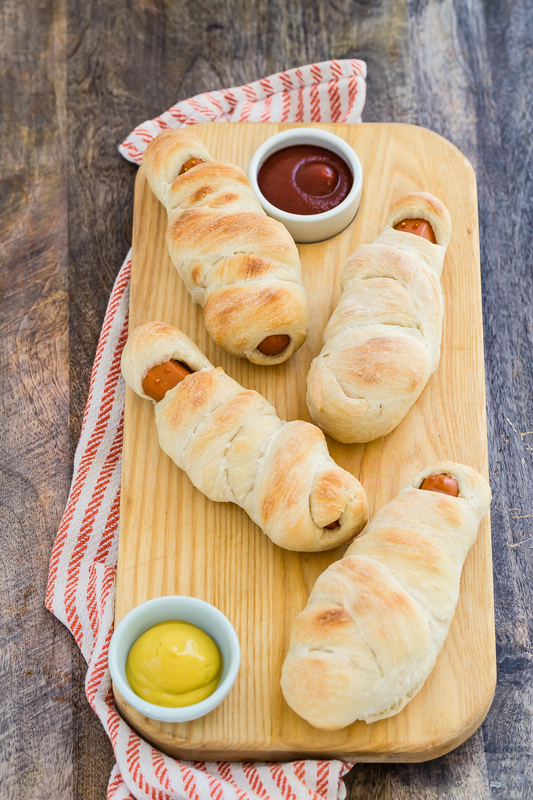 Place the wrapped hot dogs on the cookie sheet and bake for 15 minutes. 7. When the hot dogs are cool, dot the ketchup and/or mustard with a toothpick for the eyes. These are just adorable... Loved their lil faces peeking out from the dough. I just loved this idea. I will be having a Girl Scouts meeting this week and will definetely be making this for the girls. They are going to love it. I made it for my kids and it was a hit. They love it and so did I. Great recipe! I've been making these for years - before kids even. My husband just loves them and like you said, they are easy to send in a lunchbox. I use a refrigerated tube of breadsticks and wrap those around the hotdogs before baking. Great idea. However, for lunch box note...I don't think I have eaten a cold hot dog. Does that keep okay and taste okay not warmed? What a clever idea, fun for kids to eat! I use two brands, Smart Dogs for veggie dogs and anything with no nitrates, Whole Foods and Trader Jo's both sell no-nitrate hot dogs. I like turkey or veggie dogs from either place. Just wondering roughly how much pizza dough is needed for this recipe? Don't have a Trader Joes here so I'm going to go to a local pizza place to get dough to make these, but not sure how much ill need? Thank you very much! Wow, that is awesome. My wife has been making this soaked-whole grain bread for weeks now and when we tried to make \"hot dog buns\" it wasn't what she pictured. What a great idea! Now we're ready to try again. Thanks for the awesome recipes! A silly question... But does Kenya eat it cold in his lunch or do they hear it up? Lunch is served at room temp. Nothing is heated up!